The Magi or the Three Wise Men were three men guided by the Bethlehem’s star to honor and complement God’s son after his birth. This story, based on the Gospels of Matthew, has turned the Three Kings in regular characters of nativity scenes. The tradition of the nativity scenes is widespread in Spain, since this is a Catholic country. In Madrid from the last days of November to Epiphany –on January 6– there are several nativity scenes decorating the city. Among the most popular are the one placed in the Plaza Mayor by the City Council and one in the famous department store El Corte Inglés. Check the list of the best Nativity Scenes in What to do in Madrid in December. Although the figure of Santa Claus has gained some recognition in the last decade in Spain, the real protagonists of Christmas are the Three Wise Men. They are responsible for bringing gifts to children who have been good during the year. Thus, children in Spain write letters in the period between Christmas and New Year, to the “kings” instead to Santa. Each one of the Magi represents a different continent –Melchior (Europe), Caspar (Asia) and Balthasar (Africa). Thus, they bring the present to children from Orient. The three wise men usually bring what children asked in their letters, but traditionally naughty children received coal as a present. It is not a regular coal pieces, is a candy made to look like a rock. Most bakeries in Madrid sale coal to warn children and convince them to behave. Originally real coal was given away, but eventually the sweet coal became popular to reduce the cruelty of the punishment for the naughty children. Today even good children get coal, since the candy is really funny and tasty. The day before Epiphany children prepared food for both the Magi and the camels –cookies or cake for the men and grass for the camels. Also, that day kids visited the Magi’s pages –usually located in malls and department stores– in order to deliver their letters. Finally in Epiphany’s Eve, families assist to the Three Wise Man Parade. Every major Spanish city has its own Epiphany Parade, but he most impressive one takes place in Madrid. This important event is broadcasted on national television during prime time and is one of the most watched of the year. The first documented Epiphany Parade held in several cities in Spain was in 1855, but there is oral evidence that they already existed in the nineteenth century. The oldest and most traditional Three Wise Men Parade is held in Alcoy from 128 years ago. In Madrid, the first parade took place in 1928. The Parade usually starts around 6:30 p.m. in Nuevos Ministerios area and goes all the way across the city to end in a stage in Cybele’s Fountain. In order to get a spot along the Epiphany Parade people camp early in the afternoon. 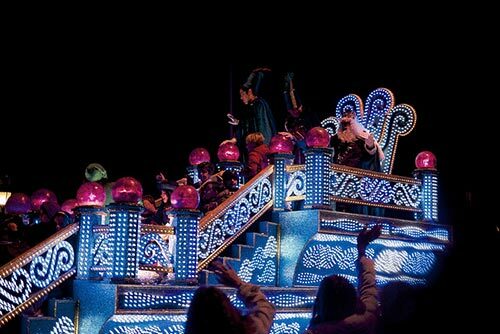 During the Parade, the Three Wise Men are preceded by a procession floats with theater, puppets, clowns, and music shows on board. The last float is occupied by the Magi who are giving away candy along the way. The candies in the Madrid’s Parade are sugar reduces, gluten-free, lactose-free and nuts-free. At the end of the parade the Magi give and speech for the crown and inaugurated the fireworks show held in the Cybele’s Fountain. If you are spending Epiphany in Madrid, this is show you shouldn’t miss. 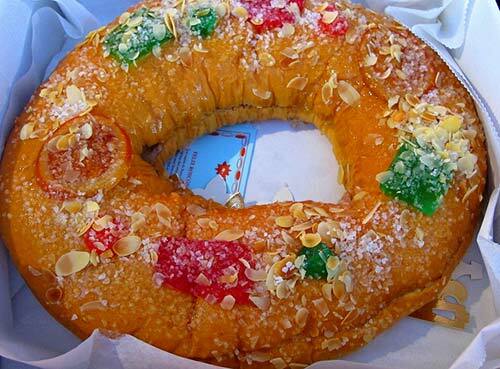 The “Roscón de Reyes” or Epiphany Cake is a huge brioche-dough sweet bagel decorated as a crown that is usually eaten for the Epiphany Day lunch or in the evening with hot cocoa. It can be plain or stuffed with cream, truffle or custard. In the outside is usually decorated with dried and candied fruits –such as oranges, figs or cherries– and nuts. Inside the pastry the baker insert a prize and dry bean. The person who gets the prize can wear the golden cardboard crown included with purchase of the roscón. By contrast, the one who gets the bean has to pay the roscón of next year. The best Madrid Epiphany cake can be purchased at El Horno de San Onofre (San Onofre, 3), El Riojano (Mayor, 10), La Duquesita (Fernando VI, 2) and La Marina (Alberto Aguilera, 14).